Hurricane Isaac caused a lot of problems for residents in south Louisiana, but it has had a positive effect on fishing in the area. Saltwater was pushed up into the estuaries and in return many bait fish and shrimp ended up further north than expected. Last week, shrimp and pogies were in the northern end of Lake Salvador, which has led to fishermen catching redfish, speckled trout, black drum and even flounder. Kenny Domangue and I had a lot of success near Bayou Bardeaux to the old oak tree in the mouth of Bayou Couba. We saw two other boats that were throwing chartreuse colored baits under a cork 200 yards out from the shoreline and catching fish. The fishermen worked in circular patterns in the area out past some crab traps. We tied on quarter-ounce jig heads and put 2-inch chartreuse sparkle beetles tipped with shrimp and began catching redfish, speckled trout, catfish and black drum. A couple of days later, Pete Cassagne and I returned on a morning trip to the same area and repeated the scenario. Cassagne was using a 2-inch white sparkle beetle and I was using a 2-inch chartreuse sparkle beetle tipped with shrimp. We caught plenty of redfish, speckled trout, black drum, catfish, bass and one big flounder. “I hit the grand slam today! I caught five different fish,” Cassagne said. “Speckled trout, redfish, catfish, black drum and a flounder. While fishing, we observed big shrimp being chased by redfish and speckled trout. Occasionally, big schools of pogies would blow up in the clear water. Getting to Bayou Bardeaux (most fishermen know this area as Bay Badeaux) is easy. If you launch at the Bayou Segnette State Park, run south along Bayou Segnette until you reach the mouth of Lake Cataouatche. Go through Bayou Bardeaux into Lake Salvador and head west. 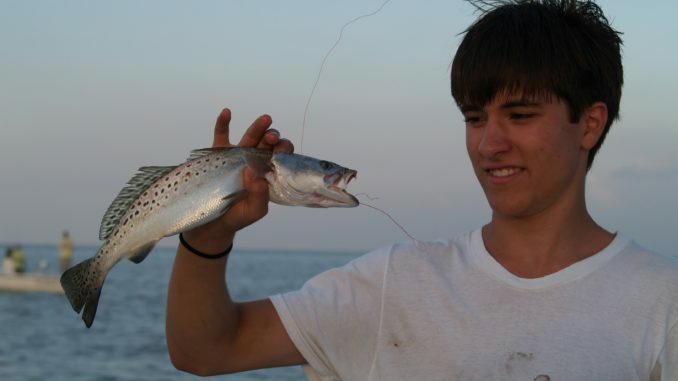 Begin fishing the southern shoreline of the Timken Island to Lucky Seven, and to the mouth of Bayou Couba. If launching out of Pier 90, cross Lake Cataouatche and head south to Bayou Couba. When you reach the old oak tree, begin fishing on the south shoreline, heading east along the shoreline to Lucky Seven and Bayou Bardeaux. The best baits have been quarter-ounce black/chrome rattle traps, 2-inch white, glow, or chartreuse sparkle beetles, and glow or chartreuse D.O.A.’s tipped with market shrimp 12 to 18 inches under a popping cork.